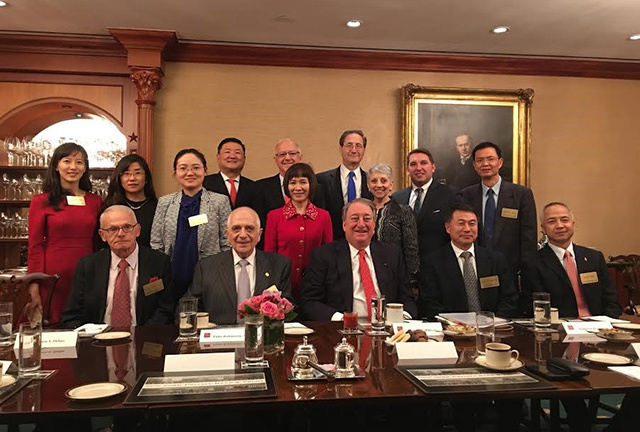 NEW YORK, NY – The Milstein Medical Asian American Partnership Foundation (MMAAP Foundation) hosted a holiday luncheon in celebration of the Chinese New Year at Emigrant Savings Bank in New York. The MMAAP Foundation brought together leadership and grant recipients to celebrate a very productive and successful year. In 2015, MMAAP Foundation offered eleven awards; six fellowship awards and five project awards in the areas of geriatrics (under the Irma and Paul Milstein Program for Senior Health), dermatology, hematology, translational medicine and reproductive medicine. At the luncheon, current fellowship awardees of the Irma and Paul Milstein Program for Senior Health and Reproductive Medicine were honored, including: Dr. Haiyan Zhang, Professor from China Medical University, Dr. Jinlei Li, Investigator from Peking Union School of Public Health, and Dr. Xin Chen, Associate Professor and Deputy Chief physician from the Reproductive Medicine Center at Nanfang Hospital, China. In attendance were Howard P. Milstein, the Chairman, Sean X. Leng, MD PhD, the President of the MMAAP Foundation, Mr. Stephen Orlins, President of the National Committee on U.S. – China Relations, representatives from China Association for International Exchange of Personnel, Mr. Haiyang Wang and Mr. Dingming Wang, along with advisors and staff members of the MMAAP Foundation. Building on the accomplishments of 2015, MMAAP Foundation is looking forward to another successful year, the Chinese lunar calendar’s Year of Monkey. The Foundation will continue bringing together and funding exchanges between top researchers, medical talent, and medical institutions.